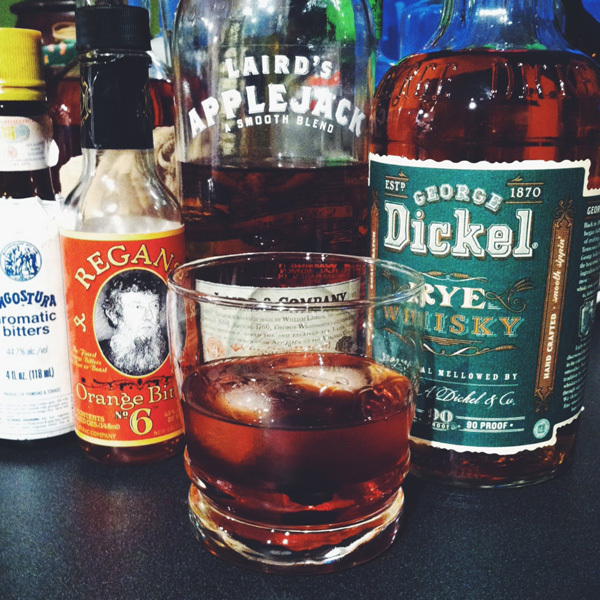 I created this drink in January 2014 while skiing in Vermont*. My girlfriend, some friends and I were staying at a rather hilarious but picturesque AirBnB house in Arlington. We arrived late in the evening, unpacked our bags, I unpacked my traveling Home Bar and the friends asked me to make a drink. This was that drink. Soon afterwards I posted it on BarNotes and its has become my most popular cocktail on the site! Enjoy! Add ingredients to tin with cracked ice and stir. Strain into rocks glass and serve on the rocks. Maraschino Cherry garnish. *Just a short word on Vermonty: I love Vermont, I love it so much that I usually just call it Vermonty. Its Green Mountains are stunning, its land-locked inhabitants are quiet, helpful and a bit reclusive, its Maple Syrup is abundant and its Skiing is thrilling!